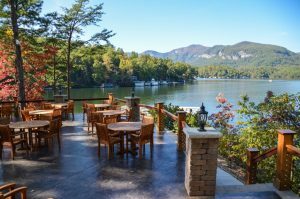 The Lake Lure Lodge’s Tree Tops Restaurant offers sweeping, panoramic views of Lake Lure and surrounding Blue Ridge Mountains. With both indoor seating as well as outdoor al fresco dining on the veranda, the restaurant features a relaxed ambience set amidst breathtaking natural beauty. Tree Tops culinary team creates a rotating, seasonal menu using locally produced vegetables, meats, breads and cheeses sourced from the areas best farmers and artisans. Also, enjoy a hand selected wine list to compliment your dining experience.